Airway obstruction is a very real emergency medicine issue. When a person is losing his or her airway right in front of us, we are responsible. It’s the ultimate life-saving intervention. We need to handle airway obstructions with “TLC.” TLC means noting the TIMING, LOCATION and COMPRESSIBILITY of the lesion. Timing of the airway obstruction is the big issue here. If an enlarged tongue swelled up gradually over seven days, the severity of the situation is less volatile. If the swelling occurred over the past 20 minutes, it’s an entirely different situation. How fast did the airway obstruction come on? When looking at an airway, there are two big issues: can I AMBU bag them to oxygenate and ventilate, and can I intubate them? I can’t AMBU bag a patient with BONES in their mouth. BONES is a mnemonic to evaluate whether or not I can adequately AMBU them. B=Beard. If a patient has a beard like Santa, I will not be able to get a good seal. This is bad. N=No teeth. It’s more difficult to get a seal if the patient doesn’t have teeth. S=Snores/Stiff. This means if that the patient has stiff lungs, it can be more difficult to form a good seal. Using this mnemonic can help you make faster decisions and provide more efficient medical care. Our Emergency Medicine CME packages offer more mnemonics and input, designed to help you engage with the material and enjoy learning. 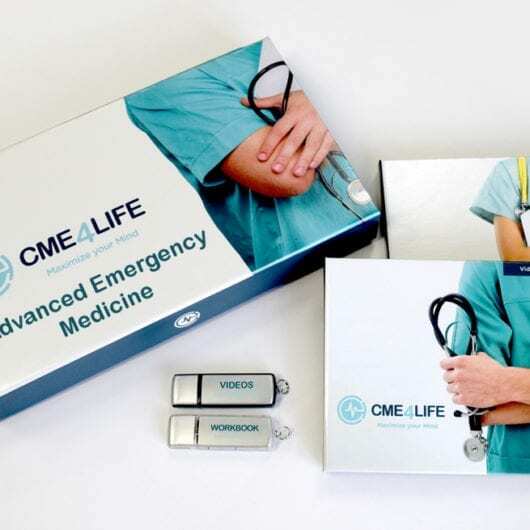 Our CME shop has a full range of our EM CME packages (plus CME with free iPad or gift card).